TORONTO (May 6, 2016) – The National Hockey League Players’ Association (NHLPA) announced today the three finalists for the 2015-16 Ted Lindsay Award: forward Jamie Benn of the Dallas Stars, goaltender Braden Holtby of the Washington Capitals and forward Patrick Kane of the Chicago Blackhawks. The Ted Lindsay Award is presented annually to the “Most Outstanding Player” in the NHL, as voted by fellow members of the NHLPA. 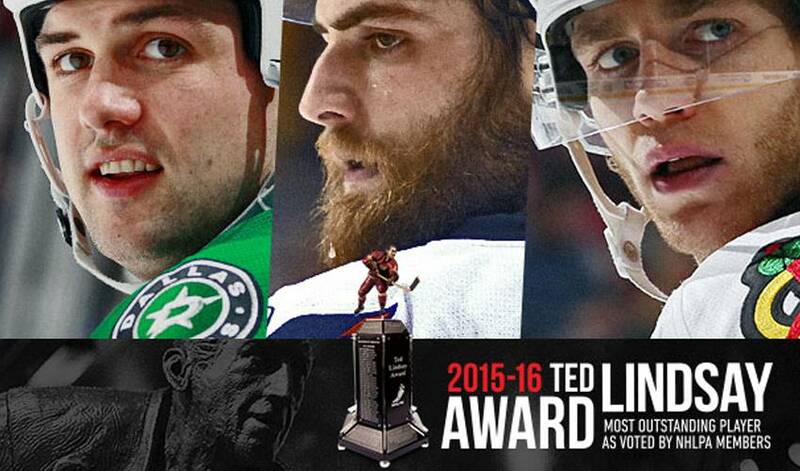 Benn, Holtby and Kane are each seeking their first Ted Lindsay Award. The 2015-16 Ted Lindsay Award recipient will be announced on Wednesday, June 22, during the 2016 NHL Awards at the Hard Rock Hotel & Casino in Las Vegas. The Ted Lindsay Award is the only award voted on by the players themselves, carrying on the tradition established by the Lester B. Pearson Award dating back to 1970-71. The Award honours Ted Lindsay, an All-Star forward known for his skill, tenacity, leadership, and for his role in establishing the original Players’ Association. Benn, of Victoria, B.C., Canada, played in all 82 regular season games for the Dallas Stars in 2015-16. Benn finished second in the league in points (89) and third in goals (41) — both career bests. He also ranked second in the NHL in points-per-game (1.09) and tied for second in both power-play goals (17) and power-play points (30). Benn set career highs in shooting percentage (16.6%) and average minutes-per-game (20:01). He captained the Stars to a first place finish in the Western Conference. Benn is seeking his first Ted Lindsay Award, as a finalist for the second consecutive season, and he would become the first Stars player in franchise history to be honoured by his fellow NHLPA members. Holtby, of Lloydminster, Sask., Canada, played in 66 games for the Washington Capitals in 2015-16, helping his team win the Presidents’ Trophy for the most regular season points. Holtby posted a career-high in wins (48), setting a franchise record and tying Martin Brodeur’s NHL record for most wins in a season. He finished fifth in goals-against average (2.20) and eighth in save percentage (.922), and he is also a finalist for the Vezina Trophy. Holtby, a first-time Ted Lindsay Award finalist, is looking to join teammate Alex Ovechkin as only the second Capitals player to receive the “Most Outstanding Player” award. He would also make it back-to-back honours for a goaltender, following Carey Price receiving the Award last season. Kane, of Buffalo, N.Y., United States, played in all 82 regular season games for the Chicago Blackhawks in 2015-16. Kane led the NHL in points (106) to earn his first Art Ross Trophy. He also finished first in points-per-game (1.29), first in power-play points (37), second in goals (46), tied for second in power-play goals (17), tied for second in game-winning goals (9), and ranked third in assists (60). Kane’s totals in goals, assists and points all set career highs. He helped lead the Blackhawks to the playoffs for the eighth consecutive season. Kane — a first-time finalist for the Ted Lindsay Award — is seeking to become the first Blackhawks player and the first U.S.-born player to receive the Award. The three finalists for NHL trophies are being announced by NBCSN in the United States and Sportsnet/TVA in Canada on Stanley Cup Playoff broadcasts through May 7, during pregame programming. The series of announcements continues on Saturday, May 7, when the three finalists for the Hart Trophy will be unveiled. In this week's Player Q&A, find out what type of food Patrick says he could eat for the rest of his life and what action-packed TV show he can't miss. Get your 'Holtby Things' fix in this week's Player Q&A with Braden Holtby. It's comes as little surprise that B.C-born Jamie Benn grew up with an affinity for the Canucks jersey, but his favourite movie reveals his love of another sport!